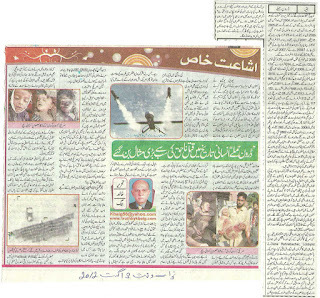 Truth by Kbaig: “DRONE ATTACKS” The Greatest Example of Unlawful homicide..! Terrorists who were threat to USA killed in a Drone Attack? European Union has increased pressure over Pakistan to revoke the law for death penalty. The member countries of EU are of the view that through an amendment in the law death penalty should be dropped. Human rights organizations are also struggling since a long time for such amendment. Within Pakistan there is also abundance of such elements who term death penalty as an EXTREME punishment but over the extra-judicial killings of USA through Drone attacks EU, Human Rights organizations and all other activists have no objection. Role played by them is not only the symbol of their double standards and hypocrisy but also a slap over the self-proclaimed torch bearer of human rights, so called civilized society i.e. WEST. Death sentence or penalty given by courts has a procedure and in the light of the evidence court awards death sentence to a convicted culprit. This is necessary for the justice to the heirs of the murdered persons; otherwise one may take law into his hands to take revenge thus risking the peace of society. In contrast to this Drone attacks are an extreme step violating all legal, international, moral and human values; in the other words they are the living example of state terrorism. The era in which powerful states and generals attacked the weak and poor states, massacred the public of defeated state, gang raped their women, destroyed crops and houses, men and women were taken as slaves; is remembered as black age in today’s social sciences. In the history Hilaku Khan is hated for building minarets of human skulls, Hitler is hated for his genocide of Jews; all this is not in the books only but in the brains of everyone through the movies of Hollywood. These movies imprinted Hitler as an example of hatred and barbarism. What about BUSH and OBAMA??? One started the massacre and genocide and other took it to the extremes. During the reign of Obama even the persons participating in the funeral prayers are not safe from US terrorist drones, while according to the UNO singing the chorus of HUMAN RIGHTS and Geneva Convention when two armies are bombarding each other during the war it is not permissible to target hospitals, places of worship, ambulances and paramedical staff collecting dead bodies or injured, the attack over the funerals is beyond the imagination for humanity if there is any HUMANITY. But no one is safe from American barbarism and terrorism, in Afghanistan, Iraq and Libya, American and NATO war-jets specially targeted hospitals, schools, universities and civilian houses and the most favorite target were innocent children and women. 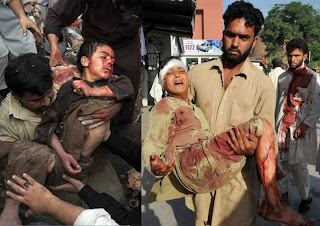 In Pakistan through drone attacks all the limits for insulting humanity has been crossed by modern terrorist state. Innocent children, women, elderly and innocent persons all are target of US drone missiles; all these state terrorist crimes are being done in the name of protection of USA and US public. Have American public given vote to Obama administration to massacre and murder innocents, thousands of miles away because American state terrorist agency CIA thinks they are threat to America? Look at the extreme of injustice first the specific houses are targeted by terming them as houses of terrorists. Afterwards when local people gather for funeral of persons murdered in American state terrorism before their burial they are killed by US drone attacks as well; all this terrorism is covered that it might be possible that colleagues of these terrorists are present in these funerals. Painful aspect is that European countries, so called human rights organizations and modern elements of Pakistani society feeling proud in expressing their treason to religion are busy in struggle to end death penalty laws but they are deaf and dumb on the murder of innocents in the funerals by American terrorists via drones. Why only these anti-religion so-called modern elements; there is democratic govt. selected through the votes of the public from last four years and is going to complete five years of democracy soon; but this democratic govt. has never dared to take any serious steps on international level against these terrorist drone attacks. It seems these selected representatives of Pakistan have no POLITICAL WILL to end drone attacks by USA. This bitter reality might hurt some but this is the fact that during the reign of dictator Musharaf first drone attack in 2004 in which four persons were murdered, two attacks in 2005 killing seven persons, in 2007 total four attacks killing 77 persons. In this way from 2004 to 2007 total 9 attacks killing 112 persons. Target of American WAR ON TERROR or WAR ON HUMANITY? 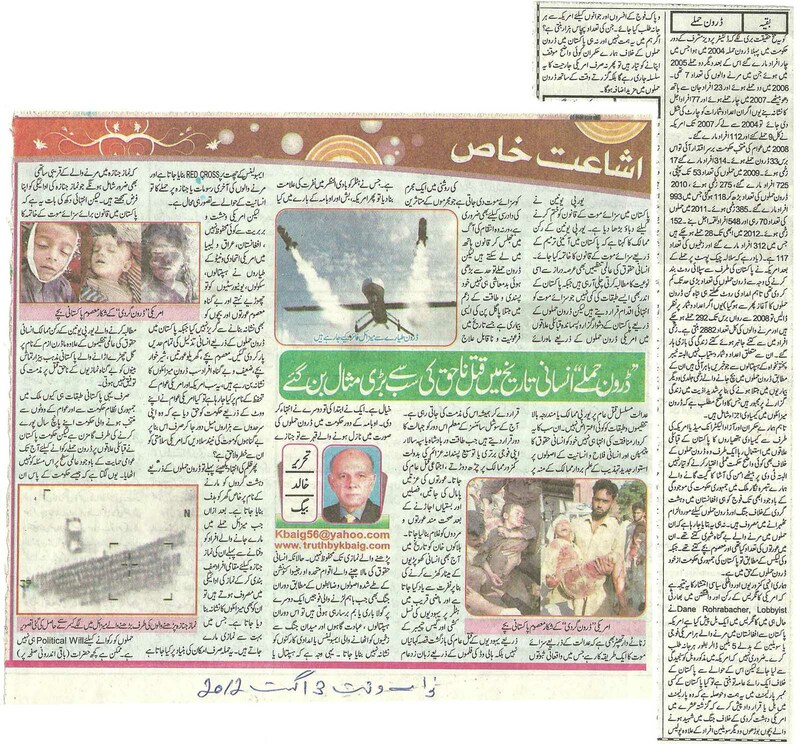 In 2008 when democratic govt. 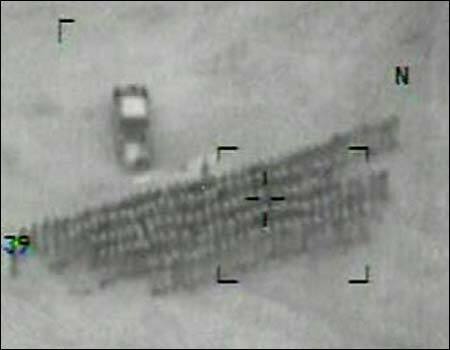 came into power nation witnessed 33 drone attacks in the first year with 314 kills and 17 injured. 2009 ended with 53 drone attacks from a civilized terrorist state taking lives of 725. 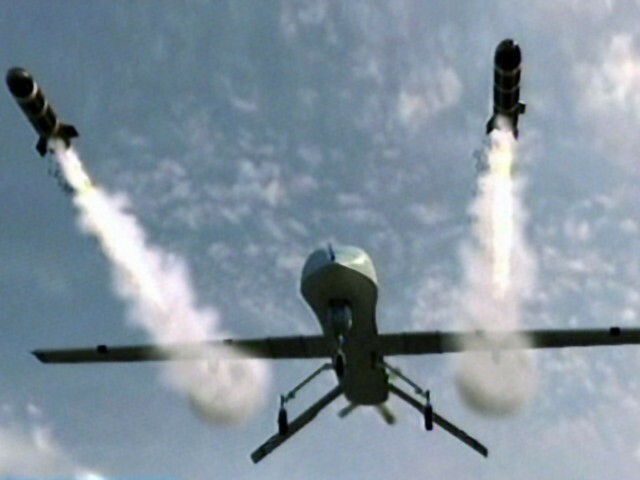 In 2010 drone attacks climbed up to 118 claiming lives of 993 persons and 385 injured. In 2011 the number attacks 70 killing 548 persons. From the start of 2012 till now total drone attacks 28 and number of persons killed are 312 with 117 injured. Here one thing should be kept in mind that after attack of NATO state terrorists over Salala Check Post when NATO supply was suspended a decrease in drone attacks was observed but since the selected and elected govt. of Pakistan has restored the NATO supply violating and ignoring the resolutions of Parliament and voice of nation the number of these terrorist drone attacks is again on rise. If we look at the figures since 2008 to 2012 Pakistan has been target of 292 drone attacks with 2882 causalities. These causalities do not include those who died after being injured. While according to the reports from hospitals those who survived these drone attacks are living a miserable life suffering with skin and other diseases. This means that USA is using chemical weapons in her drone attacks; if one may remember Iraq was destroyed in the name of chemical weapons which these American state terrorists are openly using to kill innocents in Pakistan. However the protest of our elected govt. and electronic media over use of chemical weapons aside they are not ready to present a solid policy against state terrorism of USA i.e. drone attacks. On the other hand the employees of foreign elements singing the chorus of AMAN KI ASHA in their talk-shows are busy in blaming Pakistan army for terrorism in Afghanistan in spite of the fact that there is elected democratic govt. in Pakistan. No one is ready to tell the facts that how many innocents were murdered in these drone attacks, how many children and women became target of US terrorism while according to wikileaks Pakistan’s elected democratic govt. itself is in favor of drone attacks (to collect dollars for the dead bodies of innocent Pakistani tribals).